On the evening of March 13, seminarian Anthony Hollowell was doing homework in his room at the Pontifical North American College (NAC) in Rome when he glanced over at his computer monitor that showed a live video feed of the chimney of the Sistine Chapel. The previous day, Hollowell had proclaimed the first reading at the Mass celebrated in St. Peter’s Basilica just prior to the start of the conclave to elect a new pope. When he looked at the monitor, he saw what millions of Catholics around the world had been waiting for during the previous 24 hours—white smoke. “I yelled ‘Habemus papam!’ and sprinted out the door. I was in the square in three minutes,” said Hollowell, a member of Nativity of Our Lord Jesus Christ Parish in Indianapolis. 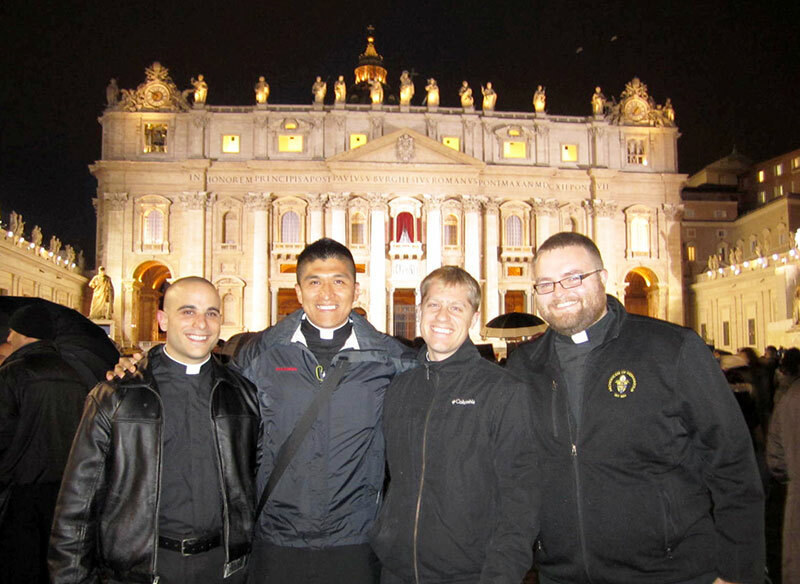 Also in the square that night were three other archdiocesan seminarians receiving their priestly formation at the NAC—Matthew Tucci and transitional deacons Douglas Marcotte and Martin Rodriguez. Also present to witness the historic moment was Benedictine Father Paul Nord, a monk of Saint Meinrad Archabbey in St. Meinrad who is doing graduate studies in Rome. All of them shared their experience of the papal election in e-mails sent to The Criterion. As Hollowell made his way to the square bursting with excitement, he saw lots of people doing the same. While Hollowell saw the white smoke on his computer monitor, Deacon Rodriguez was in the square watching it in person. He was also excited because the cardinals had elected a Latin American like himself as the new bishop of Rome. But Deacon Rodriguez’s pride extended beyond his ethnicity when he saw fellow Catholics from around the world surrounding him in the square. Deacon Marcotte shared that excitement and pride as well. The appearance of Pope Francis on the balcony of St. Peter’s Basilica had a positive effect on Tucci. And like his fellow seminarians, he was impressed by seeing so many Catholics from around the world. Although the pope is the shepherd of the universal Church, he is also bishop of Rome. Father Paul got an appreciation of how Pope Francis is trying to make connections with Romans when he spoke with a taxi cab driver the next day. “He pointed out that Pope Francis’ first words were ‘bona sera’ (“good evening”), not “buona sera”, which is standard Italian,” Father Paul said. “The taxi driver said that Romans say ‘bona sera,’ and that he thought the new pope was intentionally using Roman dialect to appeal to the people that he will serve. The new pope demonstrated his humility shortly after stepping onto the balcony when he asked the crowd and people around the world to pray for him, and then bowed down. Deacon Rodriguez was impressed by how the people in the square, who had been screaming moments earlier, all stood silent in prayer for the new pope. Father Paul called the pope bowing down “a very profound moment.” But he was also moved by him leading the crowd in prayer for Pope Emeritus Benedict XVI. “It seems simple, but that is really the pope’s primary role, to lead us all in prayer before God,” Father Paul said. Deacon Marcotte is scheduled to be ordained a priest, along with Deacon Rodriguez and transitional Deacon John Kamwendo, in about two months. Deacon Marcotte said that Pope Francis’ humble gestures and simple prayers on the night of his election are good examples for him to follow. After racing to St. Peter’s Square at the first sign of white smoke, Hollowell eventually made it back up to the NAC where he and the other seminarians prayed before the Blessed Sacrament in gratitude for the new pope. Then they had a celebration and watched cardinals from the United States be interviewed after the cardinals made their way back to the seminary.